Insecticide powder for delousing, 1939-1945. Milk tanker, Horlicks factory, Slough, 27 January 1932. Bakelite powder box, 1921 - 1940. Saying goodbye at the station, London, Second World War, c 1939-1945. 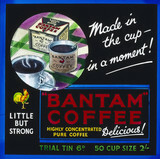 'Bantam Coffee - Made in the Cup in a Moment! ', c 1930s. 'Telegraph Les, Telephone Les, Travel Les', poster, 1939-1945. 'Campaign Posters in Garage Window, c 1939.